Websites that range from friends of mine, to information that could be helpful, to people I just plain respect. Click on names to visit them. Carolena Nericcio's San Francisco-based troupe that started the whole American Tribal Style bellydance movement. Bellydance taken to the extreme. Lovely grrrls. Now living in Montreal, she dances with such grace, that unmistakeable smile and a mischievous arched eyebrow. 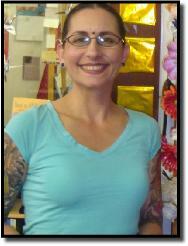 Director of Bellydance Evolution, Sahlala Dancers, and former artistic director for The Bellydance Superstars. A special place exists in Valizan's heart for The High Princess of Tribal bellydance. Carolena Nericcio at the FatChance Studio, 2008. Built like a biker, dances like he stepped off a boat from Cairo. San Diego Raks master is a nice guy and great teacher. Carries the banner of men who do Egyptian. Buffed and polished dancer based in Edmonton, AB. The “Little Prince” does Bellydance, classical Indian dance and Bollywood in Los Angeles. Turkish bellydancer dancing in Belgium. Talented Turkish dancer based in the U.K. THE place to start if you are doing research into men who bellydance. Zorba has links to practically everyone. Jim Boz at BellyUp Gala in Oakville, Canada 2008. A compatriot from The Arabesque Dance Company, and half of Cabaret Serpentine based out of Halifax, Nova Scotia. Yet another Arabesque Dance Company troupemate. The word “elegant” comes to mind when I see Ethiopian-born Saba bellydance. She also heads up Jaivah (Nouvel Expose) her African dance troupe. This power-packed dancer is also a body-builder and teaches Suhaila Salimpour format as part of her Toronto classes. One of Valizan's first teachers. Roula pushes the envelope of bellydance by creating untraditional works with traditional materials. Kindness only surpassed by her knowledge: Folklores? Egyptian Style? This is the lady. Find her in Ottawa. Hugging Jillina after The Bellydance Superstars rocked Toronto in 2007. Dark, funny and beautiful, this student of Aziza made her mark in Toronto, bought Bhuz.com and then moved to North Carolina. Mizz Khizz does it all, from beautiful Egyptian Bellydance to Poi. This lady is a joy to watch dance. Northern quartet brings their accumulated dance experience together to present a new view on bellydance to Sudbury, ON. Buffalo, New York American Tribal Style Troupe lead by Diana Miranda-Gaeddart. 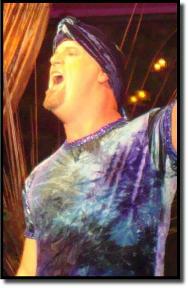 Soloist, Artistic director of Serpentine Dream and all-male bellydance troupe Extreme Taqsim. Raks on Milwaukee. Currently dancing in Perth, Australia, Safa is a close friend of Valizan, and a former member of Khafif Music & Dance. Chicago-based Tribal troupe are friends of mine from the SCA. Energetic without ever being sloppy. Blue Lotus girl in Chicago also dances as an Egyptian soloist. Creator of Tribalcon. Think Star Trek convention for Tribal bellydancers. A knowledgeable dancer. Zills served to Roula Said backstage at IBCC 2008. I've danced to and with Pittsburgh-based Khafif since I first started dancing. Good friends, superb dancers and excellent musicians playing classic Arabic, Balkan and Eastern music. This Ottawa-area Tribal Fusion artist offers dance classes, Yoga and her Shakti Fusion troupe. Elizabeth Fish leads this Milwaukee-based ATS troupe. Another talented Arabesque Dance Company compatriot. Sweet, warm, classy and very Ooh, la la! Ritesh Das leads the TTE as he teaches and performs Tabla, and shares the space with the dancers of M-Do. Indian Classical dance studio in Toronto, with Joanna DeSouza teaching kathak and directing the Chhandam Dance Company. Marry Indian music with Jazz and you have Ravi Naimpally's Toronto-based Indian/Jazz fusion band. 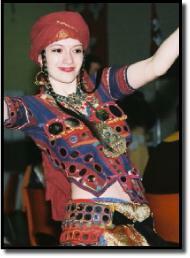 Safa, then of Khafif, dancing at an SCA event in 2005. Did a show with Indian drummer Gurpreet and was totally impressed with his skill and musicality on a variety of musical instruments.